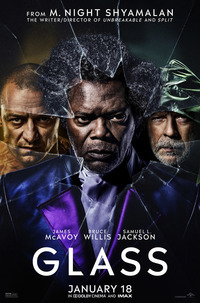 There have been few films in recent memory with as uneasy a sense of hype around them as M. Night Shyamalan’s Glass (2019). Born from the deeply last-minute twist in his previous psychological horror, Split (2016), Glass ambitiously tries to draw a narrative through line to his previous meditative superhero piece, Unbreakable (2000). Although the two films differed largely in their generic tones, it became clear that Shyamalan was cutting the two stories from the same thematic cloth. His oeuvre, is, as it goes, a tricky one - full of formal idiosyncrasies and off-beat creative choices. Centrally, though, most of his films deal with trauma and the different avenues people go down to deal with it. I’m not saying for one minute that his treatment of this sensitive subject affected me the way that, say, You Were Never Really Here (2017) did, but I always found Unbreakable and Split to be the most earnest and emotionally-intuitive works of Shyamalan’s career. Having said that, marrying these two strange takes on the superhero genre was never going to be an easy task, least of all for such a troubled and undisciplined writer. It gives me a great amount of pleasure to say that Shyamalan has pretty much stuck the landing with Glass, which assembles the disparate shards of his work as a peculiar genre filmmaker into something mostly satisfying and refreshingly thoughtful. These shards hardly come together to make a crystal-clear looking glass that alters and betters your perception of Shyamalan’s body of work, nor to make a mirror for Shyamalan to peer inside and bare his soul to a worldwide audience, but they do coalesce to form an appropriately messy tapestry of trauma that only he could create. Picking up mere weeks after the events of Split (and 19 whole years after those of Unbreakable), we find the Horde (the rogue’s gallery of personalities within the DID-stricken Kevin Wendell Crumb, portrayed in a career-best performance by James McAvoy) in the midst of a killing spree across Philadelphia, abducting and cannibalising young girls. This is all to appease ‘The Beast’, the terrifyingly strong, dominant personality leading the Horde toward moral oblivion. Enter Unbreakable’s David Dunn (Bruce Willis, unfortunately catatonic), who, having fully embraced his, um, unbreakability, has been cleaning up the streets of Philly like a very low-key Batman. News of Crumb’s crimes soon reaches Dunn, and it isn’t long before hero and villain are duking it out in a bruising brawl for the ages. They are swiftly interrupted by police - led by Sarah Paulson’s nervous china doll psychologist Ellie Staple - who whisk the two supers away to a sterile mental institution, in order to convince them that they, in fact, do not have superpowers; they are just deluded to the point of grandeur. Joining them for this reluctant focus group is Elijah Price (Samuel L. Jackson, having fun as usual), the brittle-boned terrorist mastermind (also known as Mr. Glass) who coaxed out Dunn’s extraordinary gifts in Unbreakable. The film literally commits itself to the asylum setting (pun very much intended) for the rest of its duration, which is a welcome relief for people like me who often find Shyamalan’s lack of spatial focus infuriating. Here, he finds his feet, navigating between his three most fleshed-out creations with as much grace as one could conceivably expect from him. It becomes evident from watching Glass that Shyamalan is mostly interested in the dynamic between the two shattered souls of Crumb and Price, only reintroducing Dunn occasionally as a way of interrogating the relationship between the two ‘villains.’ I do happen to have the same preference (in terms of what yields the most thematically engaging material), but it’s an undeniable disappointment to see Bruce Willis fail to expand on his quietly-brilliant performance in Unbreakable. It is perhaps even more galling that Shyamalan didn’t even provide him with the material to do so. On the other hand, this imbalance does provide some meaty material for McAvoy and Jackson to chew on, with the former in particular expanding his roster of characters and accents with aplomb. McAvoy is a wonderful performer to watch, and Shyamalan really has mined something unique in his talents, allowing him to elevate and rework the material through sheer fearlessness and commitment to the role(s). His performance is just one of the many odd sensory pleasures that Glass has to offer, which have a welcome technical factor: continuity. McAvoy’s turn simply builds and builds from Split to beyond as Glass progresses. Credit, though, has to go to the people behind the camera as well; It Follows (2014) cinematographer Mike Gioulakis manages to blend the moody gloom of Unbreakable’s colour palette with Split’s distinctive and kinetic formal precision, and composer West Dylan Thordson does a great job of picking up from James Newton Howard’s swelling strings and marrying them with Split’s droning soundscape. If anything, Glass is an impressive aesthetic feat that manages to feel like a worthy sequel two times over. Shyamalan plays as fast and loose with logic as he always has, but it bothered me less here; his confidence and sincerity bleeds through better than ever. His off-kilter vision, it would seem, finally makes total sense in itself. But about that title. Mr. Glass may be the catalyst that allows Dunn and the Horde to find their place as different parts of an explosive equation, but as ever with Shyamalan, the portent behind his titles exceeds their literal meaning. Glass is a fragile entity, depicting fragile psychologies under immense pressure, with strong wills being broken down and built back up, all leading back to the importance of the power of self-belief. In that respect, the film provides a fitting conclusion to Shyamalan’s complex, humane thesis: those that have been broken by this cruel world are the strongest of us all. 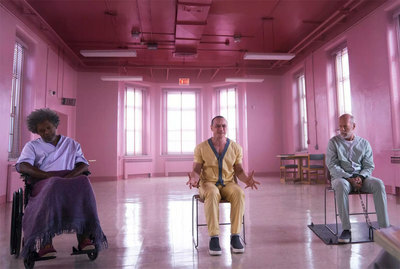 It’s a bracingly sentimental worldview, here stretched to its most ludicrous limits (Shyamalan’s claims that this is the “first truly grounded comic book movie” are lofty and rather inaccurate), but Glass is the most successful execution of these themes in this unexpected trilogy, and perhaps in his entire career. From the ground up, Shyamalan’s writing is front-to-back hokey and frequently hilarious, and yet his consistent prioritisation of themes over story and capacity for aesthetic flair behind the camera make his final (?) take on the superhero movie a glass of invigorating tonic in a cinematic climate of giant CGI krakens and universe-destroying Infinity Gauntlets. This review was published on February 01, 2019.